Now that the holidays are in full swing, you may be noticing you’ve packed on a few (or not so few!) pounds. If you’re like most people, this season—and the delicious treats that come with it—takes a toll on your waistline. It’s no wonder, when your calendar overflows with parties, big family dinners, bake sales, and other food- and drink-centric merriment. Can you avoid this (sluggish, bloated) yearly fate? Absolutely. The good news is you can bypass this depressing cycle of weight gain while still enjoying the season’s festivities. You don’t have to go hungry or crank up your exercise routine. And you can even indulge a little in those tempting guilty pleasures that help make the holidays so special. Decide your health is worth more than any sugar (plum) high. Good health and smart habits all begin in the mind. So convince yourself that you deserve to be healthy (because you do!). You’ll be less tempted to pollute your body with addictive sugar and chemicals—and you’ll think twice before finishing off a bottle of wine or inhaling those leftover gingerbread men. Speaking of sugar…kick it to the curb NOW. So many of our society’s health issues today stem from sugar. It’s astonishing, but the average American consumes about 150 grams of sugar a day; that is a mind-blowing amount. You can really see the prevalence of sugar around this time of year. And yes, you absolutely can start kicking this habit around the holidays! I assert that nutritionists across the board recommend consuming no more than 25 grams of sugar a day. The best way to stick to this limit is to keep track of the sugar content in your food. Get used to reading labels, and pay close attention to the sugar content in any packaged product. Finally, realize that manufacturers use many names for sugar, and become familiar with these sugar aliases: dextrose, brown sugar, cane crystals, cane sugar, corn sweetener, corn syrup, corn syrup solids, crystal dextrose, evaporated cane juice, fructose sweetener, and fruit juice. I can have that _____________, if I really want it. Right now, my body feels _________. If I decide to eat/drink that, my body will feel ___________. Tomorrow morning, I will feel ___________. Do I really want it? Or can I make a different choice? Drink your troubles away (with water, NOT eggnog!) Water consumption is the number one key to weight loss and keeping your weight down. It helps you feel full, flushes toxins, and keeps you hydrated and energized during the day. I recommend drinking a gallon of water a day to keep you hydrated and satiated. Not a huge fan of water? Try adding lemon or lime slices, or a few drops of a sugar-free flavoring, to improve the taste. Eat real food, and you’ll start craving it. Focus on whole food ingredients and cut out processed foods as much as possible—during the holidays and throughout the year. If it comes in a package, a wrapper, or has a commercial, it’s likely full of sugar and chemicals you don’t need. Therefore, make the lifestyle choice to mainly cook your own meals at home and use the highest quality ingredients possible. After a while your body will fall in line, and you’ll notice that you no longer crave those doughnuts, that fast food, or the bag of chips. Avoid the “fat free” trap. Fat doesn’t really make you fat, but since the 1970’s we’ve believed in this dangerous myth. Technically, a bag of sugar is fat free, gluten free, and possibly even “all natural”—yet it is toxic to your system. So don’t assume all “fat free” products are healthy choices. And keep in mind that naturally occurring fats—the kind you’ll find in olives, avocados, and naturally occurring oils—can actually help you lose weight when you are mindful of their caloric content. Step away from the mulled wine. The medical community recommends one 4 to 5 ounce glass of wine a day for women, and two glasses a day for men. However, this serving size is smaller than the typical servings people pour themselves at home. Those jumbo portions really add up calorie-wise. If you choose to drink alcohol, be aware that you are likely drinking many of your daily calories and racking up a shocking amount of sugar—especially if you drink white wine or blushes. Stick to lower-sugar red wine and clear liquors like vodka or gin instead. Break bad baking habits. If you love baking around the holidays, you could be getting more calories than you bargained for! Do you snack on chocolate chips or lick the extra icing off the spatula when you’re whipping up holiday desserts? And are you really measuring out one tablespoon of butter, or just eyeballing it? All of these missteps could be putting you at risk for weight gain. Stop the snacking while baking, and measure out your ingredients so they don’t take a toll on your waistline. Be sure to also consider swapping out those sugary recipes with lower carb versions. A quick Google search can give you plenty of healthier options for cookies and treats. And who knows, you might be surprised to learn that you prefer baking with almond flour over carb-heavy wheat flour after all! Don’t blow all of your progress at the party. It’s tempting to throw your hard work out the window when there’s an appetizing spread in front of you. Yes, party food is amazing, but you’ve got to be smart about snacking and stay strong. 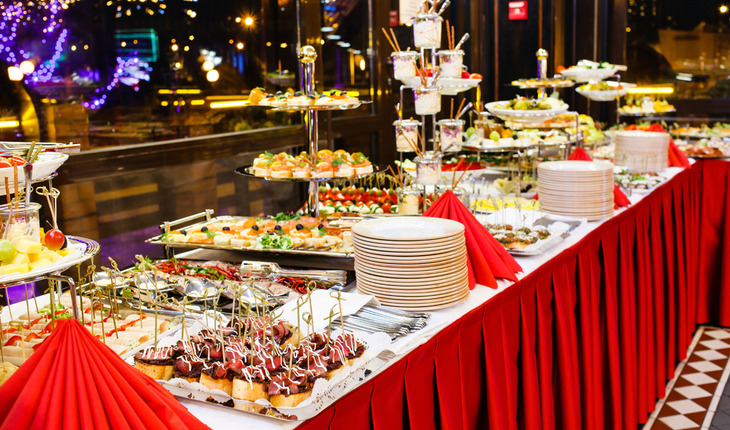 The best way to enjoy your holiday parties without going overboard is to eat a healthy dinner before you arrive. Don’t stand near the snack table, where you’ll be tempted to overeat. Fill up on veggies and dip, instead of all the cookies. If you choose to drink, only have one, and stick to red wine or a clear liquor for fewer calories. Choose a long winter’s nap over traditional pick-me-ups. The holidays are busy, hectic, and draining, but there is a healthy way to combat typical holiday exhaustion—and then there’s the other way. People get worn out this time of year, and then they opt for fast fuel like sugar to help them power through. This leads to awful sugar highs and crashes, followed by weight gain and exhaustion. It’s an endless cycle, unless you stop it. When your body responds to normal holiday stress with a sugar craving, listen to it! But don’t run out for a caramel macchiato. Instead take a nap, and aim to get to bed earlier that night. The craving battle is impossible to win, but you can circumvent it by getting a natural energy boost from plenty of sleep. Plan ahead before you travel. Holiday travel plans don’t have to derail your nutrition—as long as you plan ahead. Whether you’re traveling by plane, train, or automobile, bring some food for the journey so you can control your options. Try cooking chicken or steak to roll up in travel-friendly lettuce wraps; bring premeasured portions of raw nuts for snacking (watch those calories! ); bring your favorite protein powder to add to your water for energy; include a few tins of tuna or salami slices for a quick bite; and pack some dark chocolate for a treat while you’re on the road. Finally, beware of eating out of boredom—a common problem during travel. Make sure you and your kids stay occupied with a book, a small craft project, or something similar to pass the time without constantly snacking. Before you cheat and eat, remember your weight goals. You don’t have to totally deprive yourself of your very favorite “cheat” foods like pizza, cake, or pumpkin spice lattes. But you do have to make smart choices and abstain at least some of the time in order to be successful. Your choices should also depend on your goals. Are you currently in weight loss mode? Then sorry, you can’t have pizza, ice cream, or any of your usual treats. You can, however, have them (in moderation) once you’ve reached your ideal weight. During the holidays, having a goal to just maintain your weight is often more reasonable than trying to lose the pounds. Remember, with just a little effort, you can have a fabulous season of celebration without gaining those dreaded ten pounds. You can even lose a little weight by making smarter decisions about your dietary choices. With these easy tips, you will actually have the energy to rock around the Christmas tree, and you’ll be ready to conquer the new year at your normal weight! Cristy “Code Red” Nickel is the author of The Code Red Holiday Survival Guide: How to Maintain or Even Lose Weight During the Holiday Season. She has been in the health and fitness industry since 1994. In 2003, Cristy became a federally licensed professional boxer and fought in 15 professional fights all over the world. She was named one of the “Top 3 Most Dangerous Females on the Planet” by Ring Magazine, which landed her a coaching role on MTV’s hit series MADE. The success of that show propelled her to New York City to train top celebrities, business tycoons, models, and professional athletes. In 2008, Cristy was awarded “New York’s Best Trainer” by Allure. After retiring from boxing, Cristy settled in Boise, Idaho with her husband, Miles, and dog, Annabelle. In addition to experiencing phenomenal success with helping people shed pounds, she has a passion for road biking, mountain biking, snowboarding, and yoga. Cristy doesn’t believe in diets. She believes in teaching people how to lose weight by eating real food. Her weight loss program has helped hundreds of people lose 10% of their body weight a month, without hunger, exercise, shakes, pills, or diet food. For more information about Cristy “Code Red” Nickel or her weight loss program, please visit www.cristycodered.com. For a free digital copy of The Code Red Holiday Survival Guide, please visit www.coderedholidays.com.